The Giants win the Superbowl and the 2008 Opening day game (wo who). Great, and on Sunday the rest of the league goes out to play, meaning at days end half the league will be undefeated and the other half will be left at 000 percent. But to me, the first 3 games of the NFL season are dicey at best. I bet any coach or player will tell you the same. The teams just aren’t firing on all 8 cylinders in these three games which is why it is so hard to see just who are the elites early in season. 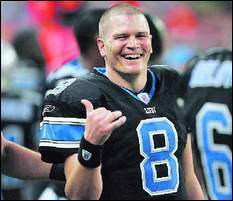 Take for example the Detroit Lions. That year they started off 3-1 and they didn’t even make the playoffs. So what am I saying you ask? Whats my point? I just saying don’t get to excited if your team wins this week and be sure not to call of work Monday if your team loses, remember there are 15 games left to play and you won’t see your real team till week 4 anyways. 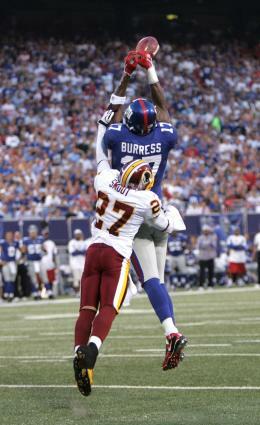 The 2009 NFL season opened today, with The Washington Redskins at the New York Giants. There were many things that happened at the game. Micheal Strahan came out of a Novelty Lombardi trophy and made a speech before kickoff. Then many fans at half time boo’d team owner Steve Tisch during “The Cancer Awareness Event half-time show” due to the his new policy on Personal Seating Licenses at the new Giant Stadium. It was pretty sad to say the least. While this man is making a speech about his fathers fight with cancer most of the fans were just booing. No one cared about the man’s personal pain over the loss of his father. Nope, not at all. The crowd instead vocalized the fact that they are angry and pissed off about PSL’s. Well, we all know NYC can be a tough town. Regardless, The New York Giants topped the Redskins 16-7. Plaxico Burress had another standout performance, picking up where he left off last post season, racking up 133 yards on 10 receptions. 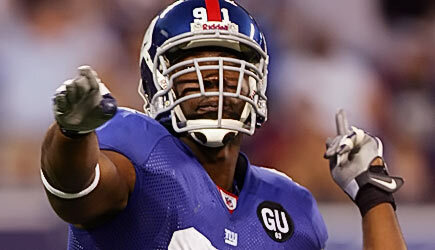 Other notable performances were Brandon Jacobs and Justin Tuck. Jacobs ran for 116 yards on 21 carries. Justin Tuck recorded a Sack on the first play from scrimmage. It was a great game for the Defending Superbowl Champion New York Giants. The only issue they seemed to have was Red zone production. It is still very early in the season, so we will have to wait and see what they can do in the red zone in the next game on Sept 14th, in St Louis. With NFL, kick off only two days away. We have been seeing many different things going on in the NFL. Teams are preparing for the season openers and our evaluating Injuries and recent free agency pick ups. Thats nothing new but do you know what is? 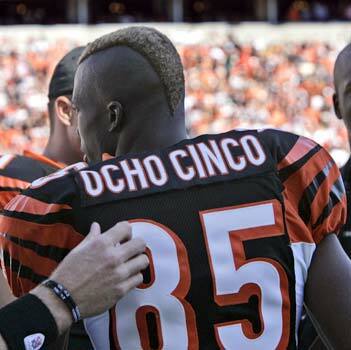 One thing that I found very interesting is that I heard a report that Chad Johnson, had legally changed his name to Ocho Cinco. We all had seen by now that Lynch has been cut by the Patriots whom one can assume will just pick him back up with a lower contract deal. 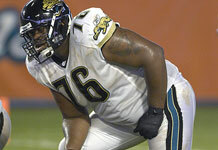 We also heard the awful news, that Jacksonville Offensive Tackle would not be playing on the field this week because he is fighting for his life, in critical condition. Our prayers go out to him and his family. “The guys are in shock. You see this kind of thing happen all the time on TV, but you never expect it in your own backyard. He’s a good dude. I just pray for him and his family and wish the best for them. I’m sure he’ll pull through.” explained Fred Taylor, Veteran RB for the Jags. This pre-season for the Jags has not been that forgiving. Just think only a couple of weeks ago Matt Jones was stuck with a felony drug charge for possession of cocaine, a couple of days ago Fred Taylor was all over the news for being cited as a public disturbance, and now this. The Jags this year seem to be on a bad news media roller coaster.